Looking for a different Castell Dinas? Try Castell Dinas Brân. 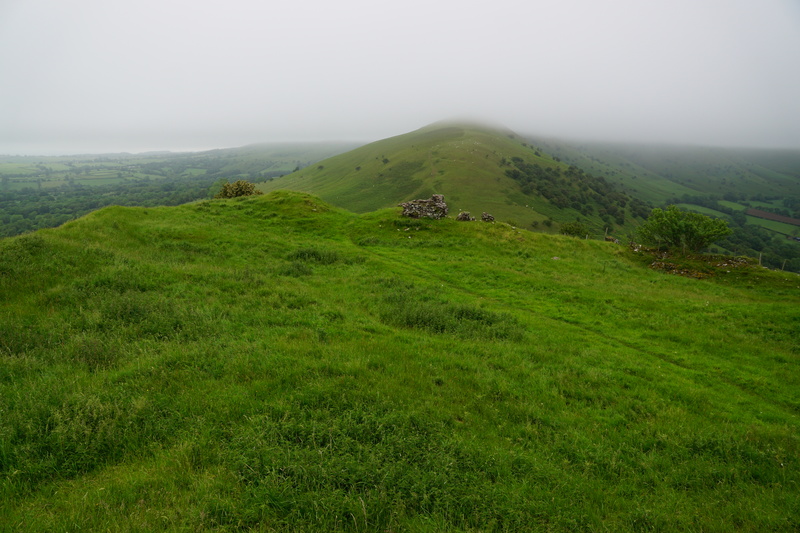 Castell Dinas, which is also known as Waynard's Castle, was originally an Iron Age multivallate hillfort and these defences were re-used when a medieval castle was constructed during the late eleventh century. The fortification was owned by the Earls of Hereford before passing into the hands of the FitzHerbert family. The castle was destroyed during the rebellion of Owain Glyndŵr. Castell Dinas translates as "Castle Fortress". The site was originally an Iron Age multivallate hillfort and these defences were re-used when the medieval castle was constructed. Precisely who built that later fortification is unclear but it may well have been William FitzOsbern, Earl of Hereford who campaigned in Breconshire during 1070. It briefly became the regional stronghold but was inevitably eclipsed by the construction of the more strategically placed Brecon Castle in 1093. However, Castell Dinas, which was also known as Waynard's Castle, continued to be occupied and in 1125 it passed into the hands of William de Braose, Earl of Hereford. 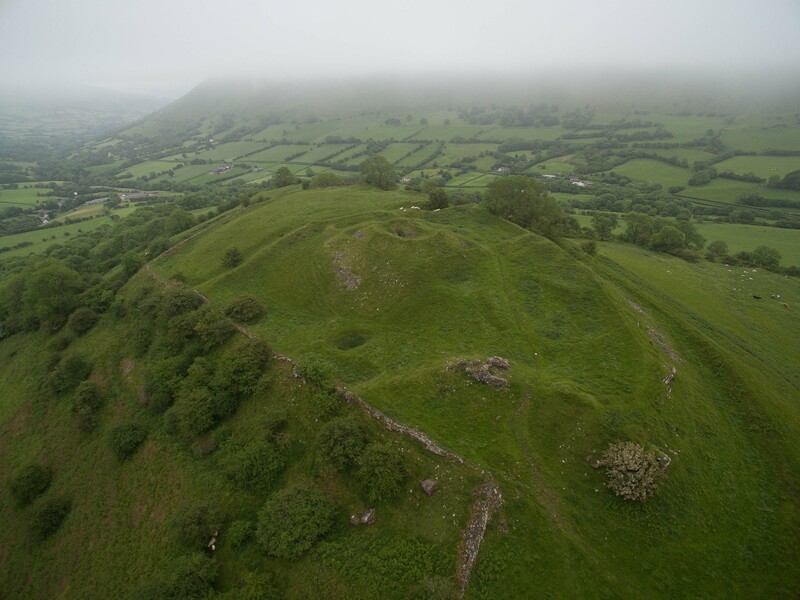 Situated on a steeply sloped foothill of the Black Mountains standing over 450 metres above sea level, Castell Dinas is the highest castle on mainland Britain. 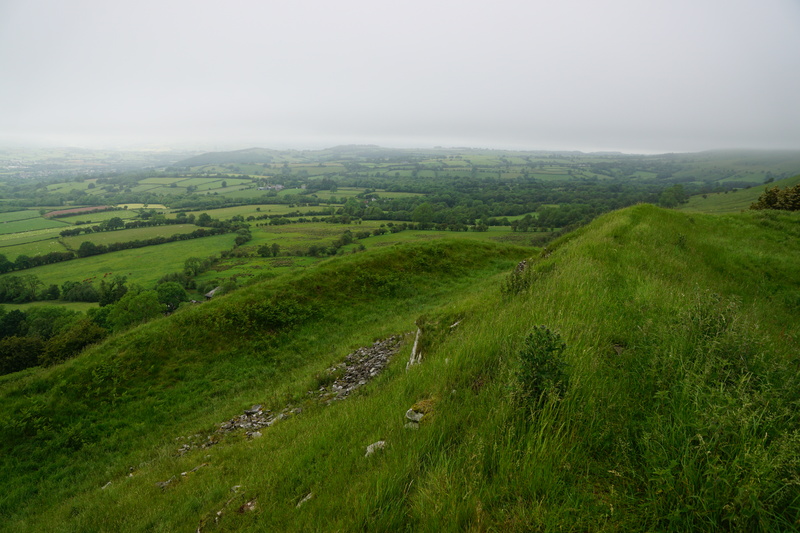 The former oval shaped hillfort occupied the entire summit with its defences consisting of Inner and Outer ramparts with a ditch in-between. The interior of the fort, which enclosed around 22 acres, was later divided into two segments by an earthwork bank and it was within the northern portion that the medieval castle was constructed. The site was dominated by a rectangular Keep, which also served as the Great Hall, whilst a curtain wall was built on top of the earthwork defences of the hillfort. Square towers were constructed along its length. A gatehouse was constructed on the northern side which again utilised the existing Iron Age earthworks. 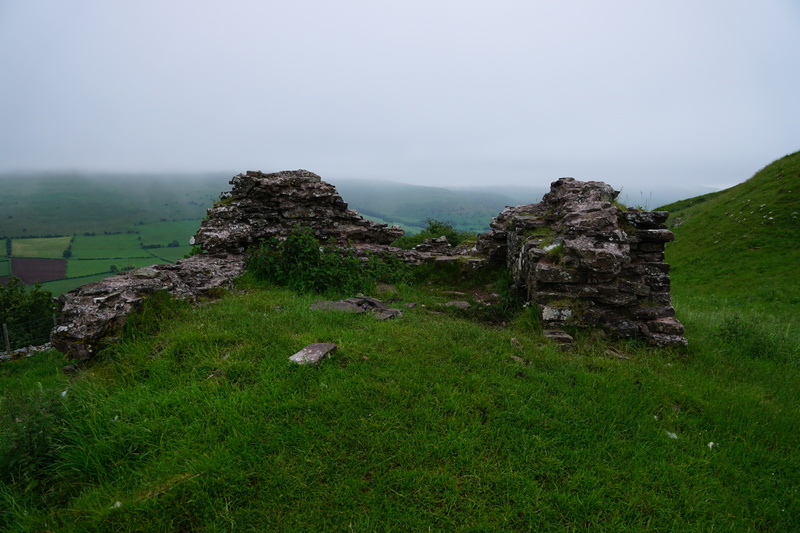 Castell Dinas was seized by King John following the downfall of the de Braose family and it was then granted to Peter FitzHerbert at which point it became the caput of the Lordship of Blaenllynfi. Some rebuilding may have occurred at this time. Peter was able to retain the site even after the restoration of the de Braose estates but in 1233 it was seized by Richard Marshall, Earl of Pembroke during his rebellion against Henry III. It was recovered, refortified and returned to the FitzHerberts but by the mid-thirteenth century it was in the hands of Walerand de Teys. In 1263 it was captured by Llywelyn ap Gruffudd who held it until 1268 after which it returned to the FitzHerberts. Thereafter the site seems to have declined as Blaenllynfi Castle became the caput of the Lordship although Castell Dinas remained garrisoned until 1326. However, a report of 1337 described the fortress as being in a poor state of repair with its Outer Gatehouse described as "weak and ruinous". Seemingly no repairs were made and the castle was allegedly completely destroyed during the rebellion of Owain Glyndŵr. John Leland, who visited the site circa-1540, described it as an abandoned ruin. Davis, P.R (2011). The Forgotten Castles of Wales. Logaston, Almeley. Hodges, G (1995). Owain Glyn Dwr and the War of Independence in the Welsh Borders. Logaston Press, London. Remfry, P.M (2007). Castell Bwlch y Dinas and the families of Neufmarché, Hereford, Braose, Fitz Herbert, Mortimer and Talbot. Remfry, P (1998). Castles of Breconshire. Logaston, Almeley. Reid, A (1998). Castles of Wales. John Jones Publishing. Castell Dinas is a ruined castle on the site of a former Iron Age fort. 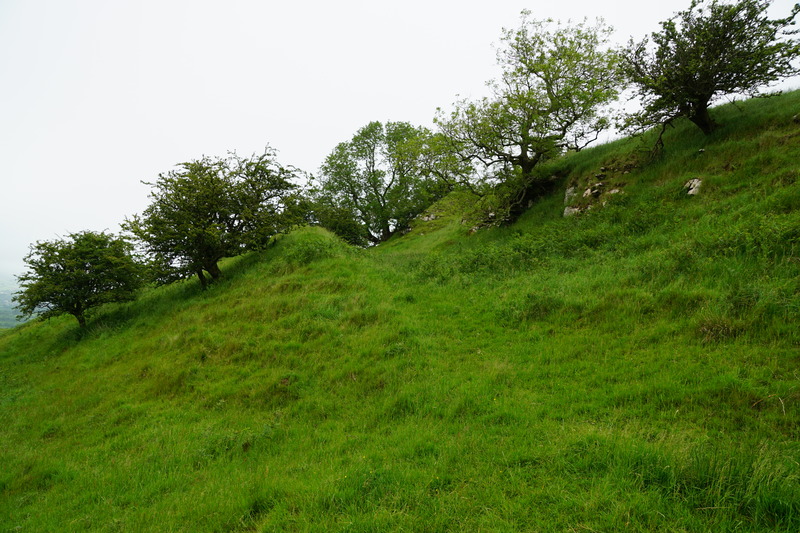 Only limited masonry remains are now visible but the ditches and scarping can be seen whilst any visitor to the summit of the site comes to appreciate the strong natural defences afforded by the hilltop location. Castell Dinas. The castle was built within the oval shaped defences of an Iron Age multivallate hillfort. The earthwork seen in the centre of the site was the Keep. Iron Age Defences. The medieval castle re-used the earlier Iron Age defences. Gatehouse. The gatehouse re-used the former entrance to the Iron Age fort. Castell Dinas is located three miles south-east of Talgarth directly off the A479. The site is not sign-posted but there is a small car park. The walk to the summit is very steep and strong footwear is recommended.